Honey's natural properties support skin's ability to moisturize. Try our Milk and Honey Cleanser to refresh depleted skin and leave it feeling silky smooth. 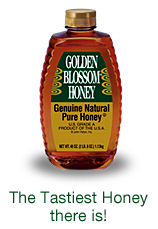 Simply adding 1/4 cup of GOLDEN BLOSSOM HONEY to your bath water will create a moisture rich skin-softening bath. Try our natural sore throat remedies next time you are feeling under the weather. The GOLDEN BLOSSOM HONEY Ginger and Honey Citrus Sore Throat Home Treatment or our Sage and Honey Infusion are sure to soothe what ails you! WARNING: Do not feed honey to infants under 1 year of age.